There are some lovely fields near the cosy cafe which Sophie Jacob runs in the village of Hampsthwaite just four miles from Harrogate. Since she first opened the doors of Sophies Coffee Shop, Bistro and Bed & Breakfast on February 25, 2010, it’s been a big success, so much so, it was shortlisted earlier this year in this newspaper’s cafe of the Year competition. But right now Sophie is worried. Rather than concentrating on baking cakes or sourcing fresh ingredients, her charming business on the village’s small high street now hosts meetings on a Monday morning each week by Hampsthwaite Action Group. For a time, plans for new housing were the elephant in the room. 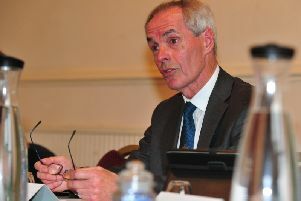 The news that Harrogate Borough Council has had to allocate a further 25 sites to meet government targets for new homes has led to a rash of action groups. It’s easy to dismiss Nimbyism but the 16,500 new houses now being proposed across the Harrogate distict represent not an isolated case but a pattern. Entire streets, villages and towns are set to be transformed in the general push to address Britain’s housing crisis. Harrogate Borough Council is arguing that development can strengthen rural communities in North Yorkshire by boosting customers for small businesses and local amenities. Sophies Coffee Shop, Bistro and Bed & Breakfast in Hampsthwaite. In terms of Hampsthwaite, the latest version of the council’s Local Plan allocates a total of 350 new houses in the village, almost doubling the current size of the village. The fear among residents such as Sophie is that this will change the whole nature of this rural community and destroy its sense of being a small village within a rural landscape. Sitting in one of the cafe’s Lloyd Loom chairs not far from its garden with its breathtaking views of the Dales, Sophie said: “I’ve been amazed how the threat of yet more houses has caused such an emotion within the village - sadness, anger and disbelief. “The village will be destroyed, the community lost and yet another beautiful part of Yorkshire completely ruined. “Despite all our objections no one seems to be listening, and this is not just Hampsthwaite, it is everywhere. One site, in particular, has alarmed residents. It’s right in the middle of the village, running parallel to the High Street, within a conservation area which lies just on the border of the Nidderdale AONB. The proposal is to put 101 houses on this meadow land. If there’s anything which has triggered the outpouring of objections from Hampsthwaite villagers it is this. Former teacher Margaret Willis, of Hands Off Hampsthwaite Action Group, lives on Hollins Lane not far from Hampsthwaite Village Hall. The action group argues that it’s not so long ago that Harrogate Borough Council itself was opposed to any development on this beautiful site. The strength of opinion in Hampsthwaite against the nature and scale of the proposed developments is such that this quiet village is now abuzz with activity. Hands Off Hampsthwaite Action Group has leafleted every home in the village. A petition to the council and landowner who is selling the site attracted more than 500 signatures and was presented recently at the Harrogate Borough Council offices on, the final day of the council’s already extended consultation time. At least 200 objections were registered with the council against the proposed development. The action group has also written to all its local councillors, to Harrogate and Knaresborough MP Andrew Jones and the land owner. It says the response has been limited. Such behaviour is all a bit new for people in Hampsthwaite. This is not usually a hotbed of agitation and politics. Sophie, for one, would rather be serving customers than dishing up protests. She said: “If people could see the beautiful field and its location I think they would all understand .